California does not permit possession or storage of fireworks without a license. Last year, I had the opportunity to learn just how serious the offense can be after a concerned neighbor contacted the police. The police were called to investigate why fireworks were being loaded into my car. I was on my way to a client’s house. The car was packed with red, white, and blue missiles and rockets. Not two minutes after I loaded the last sparkler, I see a black and white car out of the corner of my eye. I suspected someone might have gotten out of hand at a nearby party. It certainly was a police car pulling up. However, he parked right behind me, blocking my driveway. After a polite exchange of greetings, I asked the officer if he could move up a little so I could leave the driveway. The officer informed me that I wasn’t going anywhere and asked to see my license. I proceeded to give him my driver’s license. He interrupted me to clarify he needed to see my license for the fireworks. I was taken back by the question and then started to laugh. He did not think it was funny. I explained the fireworks were party favors. Nervously, I opened the trunk and demonstrated how the party favors were wrapped to look like fireworks with gifts inside. 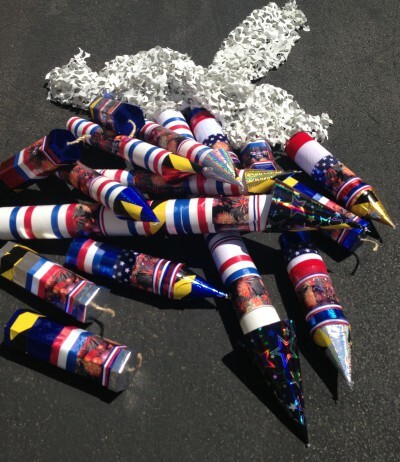 As each one of the fireworks were opened I explained how to repurpose used postal tubes and wine boxes with red, white, and blue ribbon. I showed him how to wrap the outside of the tubes with 3D images. To add authenticity to the look, I pointed out how caution tape was applied so the fireworks looked prepared by safety officials. 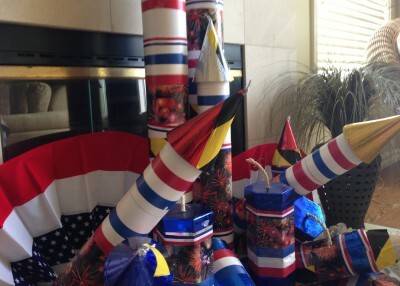 It was Christmas in July as the officer turned into a kid at the sight of each fireworks gift producing a bounty of light sticks, games, sparkler lights and 3D glasses to view the outside of the packaging. No fires. No dangerous sparks. Nobody injured with these fireworks. Just safe family fun and some good laughs with the local police. Sean Cuadra is the founder of The Gifted Horse. He creates personalized gifts, party favors, and decorations. Awesome party favors! It is a big deal though in fire and brush country. I am glad your story has a happy ending. Where is the detailed how-to on how to make them? Yes, a detailed layout is great feedback. What are your suggestions? I don’t have any, anyone who can put together those fab favors can is talented enough without me! How long did it take to put all of them back together? P.S. Sean… YOU are amazing! I love you!!! Aw shucks. Thanks, Sindi. The feeling is mutual. 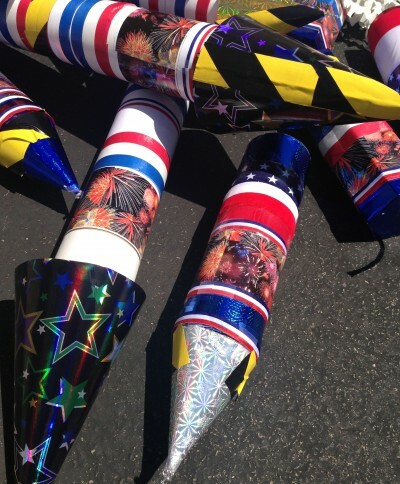 The fireworks were designed with tops that snapped on and off so they could be reused. Didn’t take long to resemble the gifts.